Introduced by Aaron A. Sargent in January 1872 and signed into law by President Ulysses S. Grant later that same year, the General Mining Act of 1872 was crafted in large part due to the various Gold Rushes from the 1840s into the late 1860s. In particular, the California Gold Rush put the U.S. Government in a bit of a bind. While the U.S. Government did have laws governing mining claims and mineral use, there wasn’t much government infrastructure in California at the time. 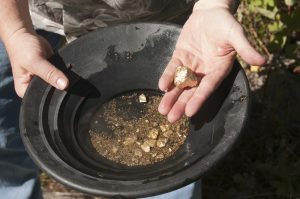 Since it was new territory, prospectors were able to head in and stake claims without any federal agents to stop them. Even though the practices were illegal, the states and territories in the western part of the country were accepting of them. However, fueled by debt due to the ongoing American Civil War, many Eastern politicians began lobbying to enforce federal law on the prospectors. They claimed the prospectors were “stealing” federal minerals on the horizon, while the Western politicians insisted the prospectors helped stimulate commerce in the area and therefore were a public good. In 1866, legislation referred to as “Chaffee’s Laws” was voted into place. It instructed local courts to ignore federal law in situations where the land was actively being used for mining. In 1870 the “placer law” extended the same rights to placer mines, and in 1872 these laws were combined to create the General Mining Act of 1872. This law set into place the still-used price of $2.50 to $5.00 per acre price of mining land. Since its implementation, it’s been amended multiple times. At the moment, Congress is debating whether or not the act needs to be amended yet again. The act has been modified to include new minerals and mineral holding land as new uses for various metals and minerals are found. As long as the United States has valuable ore and minerals hiding inside of its dirt, the General Mining Act of 1872 will be necessary as law firm practice management software. However, the more it’s modified, the less it looks like the original law. This makes it hard to say it’s still in effect, but it’s still a technically true fact.